If a commute is over a long distance, especially outside of Pittsburgh, joining or forming a carpool is a great way to lighten an impact on the environment and your wallet. According to The Earthworks Group, “If every commuter car in the U.S. carried just one more person, we’d save eight billion gallons of gas a year.” That is $445.00 for every registered vehicle in America. Carpooling has numerous benefits. It reduces the number of vehicles on the road, saves money on gas, and reduces the wear and tear on a vehicle. 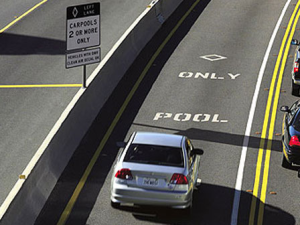 Carpooling also entitles cars to drive in the less crowded High Occupancy Vehicle (HOV) lanes, often cutting the commute time. When the costs of commuting are split among carpoolers, everyone ends up saving money each week. Roughly 10% of Pittsburghers have committed to carpooling to work. If you are considering carpooling to work, the first and largest barrier to overcome is the lack of information. Online services like the Pittsburgh page on E Ride Share list people seeking a carpool at specific locations and times. If you work for a larger institution or corporation, try speaking with the HR director for suggestions. Creating a carpool requires developing a plan and contingencies. A well-developed plan should convince even the skeptical candidate that carpooling is beneficial to everyone. Develop a timeline, calculate savings and have a backup plan that details expectations when emergencies crop up. When joining a carpool, it is always a good idea to screen candidates on the phone and in person before committing. The more questions asked and addressed in the forming and joining of a carpool, the better. Does the person seem dependable? Does the person have young children? What kind of car will be driven? Will it be okay to add more riders in the future? Is eating permitted in the car? Will the carpoolers switch-off driving responsibilities? When will the driver want payment? As the answers come in from your research, look at the logistics. Meeting at a specific location rather than a home may be better if that home is off the beaten path. Establish pick-up times with built-in flexibility. Define cost sharing on fuel, parking and turnpike expenses if necessary. If a 5-day work week carpool is out of the question, consider setting up one for just two or three days a week. You still save money and resources and gain a little flexibility. If you prefer to run errands on your way to or from work or need to occasionally schedule late meetings, you can plan those for days that you’re driving yourself. Always remember that a back-up plan is essential. Unforeseen emergencies are inevitable, and all riders should have a contingency plan.